Paste: You have said you were inspired by Noah Scalin’s Skull A Day project to create a mask every day, and that you wanted to use sneakers because they meant something to you. Could you elaborate on why you created sculptural gas masks as opposed to something else? Freehand Profit: As my MASK365 project came to an end in 2011, I had began a few different bodies of work that I could have carried forward. The sneaker gas masks were the obvious choice for me for a few reasons. Two of the most prominent being A) the challenge and B) the idea of creating objects of desire. The challenge of making the work keeps my mind engaged, that’s pretty easy to understand. The second is a response to the consideration of how and what we make as art in our time. Painting isn’t dead but it doesn’t hold the public obsession. Sculpture, after an artistic lifetime of avoiding it, suddenly seemed the appropriate art form to reflect the invasiveness of materialism in our culture. Paste: The sneakers you use are a commodity that have a cult-like following and fascination. Although the end result is an amazing work of art, in the process you destroy something of inherently high value. Could you share your thoughts on that? FP: A quote I have tattooed on my forearm by Charles Du Bos probably sheds the most light: “The important thing is this: to be able at any moment to sacrifice what we are for what we could become.” Choosing sneakers as my medium comes from a 20+ year love for Hip-Hop. Admittedly collecting kicks is a vice, one I knew I should sacrifice in pursuit of bettering my art career. Thinking “That’s money that could be spent on paints and canvas…” led to me considering sneakers as a material for art making, and gave me an idea for how to have my cake and eat it too. It didn’t start as chopping expensive kicks though, I started my journey same as I started my sneaker collection, scouring the sales racks and outlet stores. As the work progressed I discovered the more expensive kicks brought better materials but they also polarize the audience. Some folks can’t see past their perceived value of something to appreciate the sacrifice of something mass produced for the sake of art. Their anger at a trivial loss during times of such great upheaval and injustice in the world is highlighted by my work. Paste: How do you feel about this consumer culture that inhabits our day to day life? We often place more value on clothes even if they aren’t of last quality versus art. FP:I don’t want to condemn completely, some of what we consider “consumer culture” provides and improves goods & services. It also provides jobs for creatives. But when we are unaware of how deep it affects us or if we put too much value in the object, then that consumerism becomes a problem. The masks I make are also an attempt to balance the materialism. Both celebrating and destroying the sneaker, embracing the art that is already designed into the sneaker, but using the gas mask to remind us we are a world faced with war, civil unrest and environmental destruction. Paste: Besides hip-hop culture and graffiti artists, where else do you look for inspiration? FP: Ever since a kid I’ve always loved museums, to me they’re like digging through crates at a record store. Somewhere in that building (whichever museum or gallery it is), there’s a piece of knowledge that will spark or influence future work. It’s probably not hard to see the influence of comics, science fiction and Anime in my masks. Books have had an even deeper influence, admittedly something I should make more time for. American Gods by Neil Gaiman for example was a huge spark for the sneaker masks, it brought me to envision what the deities of a Sneaker Pantheon might look like. Paste: Tell us more about your upcoming show at the high-end sneaker shop and gallery space Rosewood, where you first showed your work with sneakers. How do you feel you have since evolved as an artist? FP: My artistic process changes from mask to mask so the evolution since my first show at Rosewood is significant. By pushing my limitations and by finding new solutions and developing new techniques I’m able to better make my visions into realities. 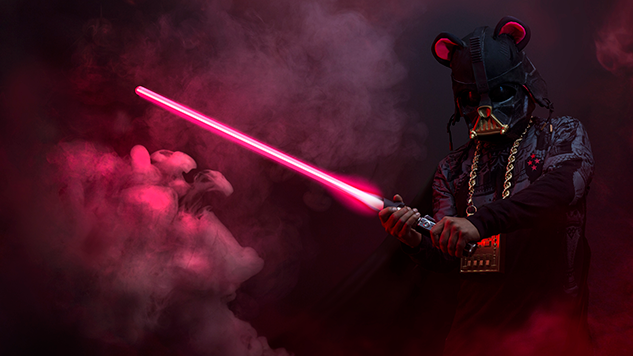 For example I’ll be unveiling a mask at the upcoming show (#RETURNoftheUNDS *) that was nearly 5 years in the making, a Darth Vader helmet made from Nike Yeezy IIs. I had the vision for it back then, but now I have the ability to make it. Paste: What advice do you have for younger artists? FP: This is something I’ve given a lot of thought and have spent some time talking with artists of all ages and stages about what advice I’d give them. And that’s this, do the work. If you want to be an artist work towards making art every day. Uncover the things that make you who you are, where these things intersect are ripe for mining ideas you can be passionate about. Seek an original voice that’s true to yourself, then continue to grow yourself and your work will grow with you. Slowly, and organically. Paste: Do you hope to keep working with sneakers in the future? Are there any other materials you hope to explore? FP: I’m not sure “hope” is always the word. I have plenty of ideas for what I can build with sneakers, but I’m always tinkering and toying with new avenues and vehicles for artistic expression. You probably won’t catch me in boat shoes or sandals but the masks are more important than the sneakers are. My biggest hope as an artist is that my audience will continue to grow with me and support the work. Paste: How do you think art can help us, with the current state of the world? FP: Art is a form of expression, and when times are tough it’s important to express oneself. If you can do it beautifully, even better. Beauty, of course, is in the eye of the beholder. Even art made in anger is a more beautiful choice than anger resulting in violence and hate. Art and artists have a long history with politics, from protest art and propaganda to portraits of monarchs and statues of dictators. The destruction or censorship of art is political. So art is extremely powerful. It can hurt and it can help. Most of all, it needs to be protected. Carolina Mesarina is a regular Paste arts contributor.